Russian ambient artist and Renaissance Man Evgenij Kharitonov first released an album as EugeneKha on Earth Mantra back in March of 2009, with his super-cool electronic ambient space music release Distant Space. 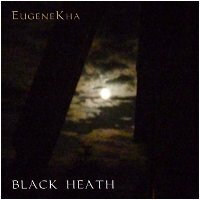 It is with great pleasure that we welcome Evgenij back to our humble netlabel, this time with a powerful and dark ambient release entitled Black Heath. This release is no exception. Unlike his previous work on Earth Mantra, with Black Heath Evgenij has created a truly ominous and foreboding collection of dark ambient pieces that are as equally scarey as they are beautiful. Truly, this is not music to be listening to in the dark on a cold, stormy night alone, unless one enjoys spine-tingling fear or the disturbing sensation that one is not alone in listening to the music. Black Heath is truly a superb collection of dark ambient pieces, and one we are very glad to bring to our audience. We look forward to every release by EugeneKha, on Earth Mantra as well as other netlabels, and look forward to more from him in the future.